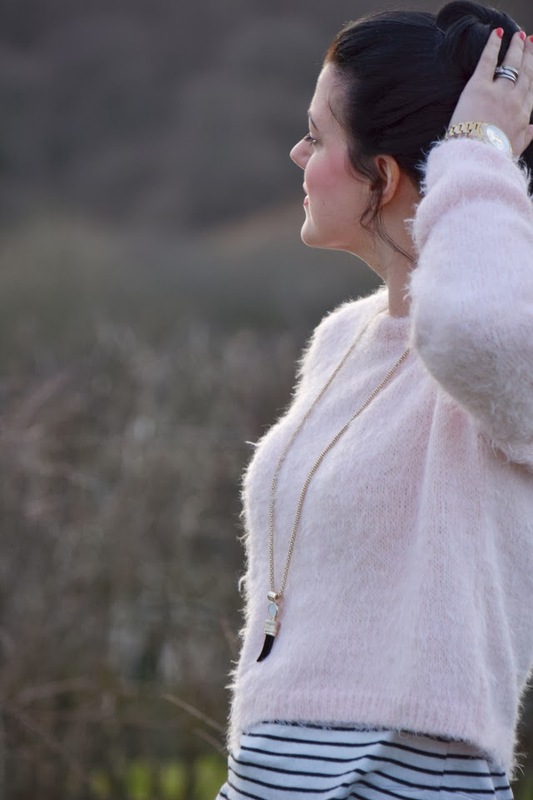 This blush pink jumper has seen a lot of wear on my back but not on the blog, its just one of those great ‘on-trend’ pieces that is easy throw on and easy to remix which makes it a constant go-to of mine lately. There was a time i would never ever have reached for a cropped style top (i blame my son for this, he left a disaster in the midriff area, but i shall forgive him as hes so darn cute and ya know, i made him an all;) BUT the wonderful thing i love about fashion is how you make it work for you! By adding a long top and i was super happy to wear this cropped number, the layering look adds interest and allows me to try the cropped trend id avoided for so long. Win win. 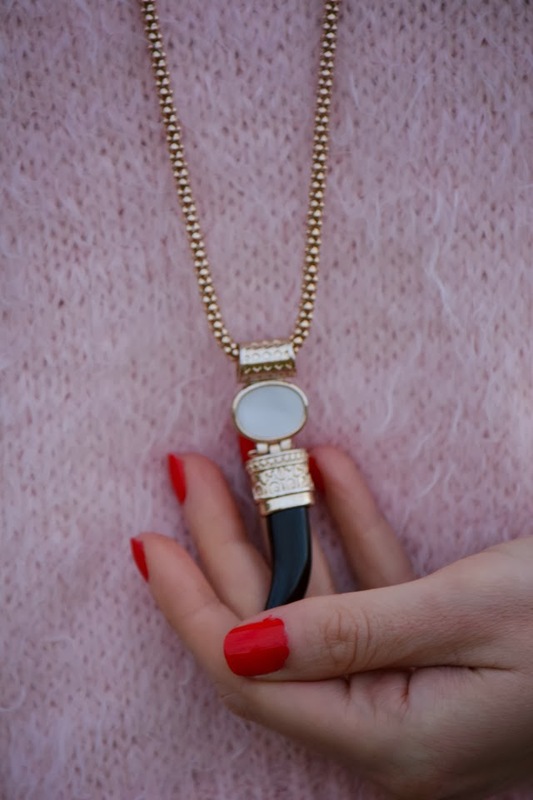 Have you ever tried a trend that was previously off limits in your eyes? Did it work well for you to try something out of your comfort zone? I love the shoes and your purse! I love the stripes peeking out under your sweater! 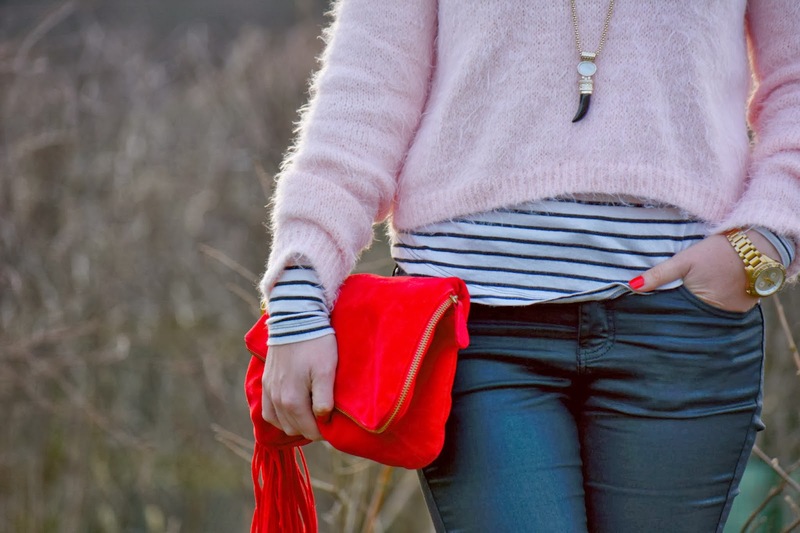 Loving the pink jumper and red bag together, they look great! that soft pink is very pretty on you! Good tip on a different way to wear cropped pieces, too. That sweater! Blush pink is one of the most gorgeous colors-and it always seems so classy! Adore this look! That is such a pretty soft pink fuzzy sweater, I love how you styled it with the B+W striped tee underneath. Your Loafers & Purse are gorgeous!! You are looking amazing Rachel!